In small bowl, stir Bisquick mix, 1/2 cup milk, 1 of the eggs and the syrup with spoon until blended. For each pancake, pour 2 tablespoons batter onto hot griddle (make 8 pancakes total). Cook until edges are dry. Turn; cook other sides until golden. Meanwhile, heat sausage patties as directed on package. In small bowl, beat remaining 2 eggs and 1 tablespoon milk. In 8-inch nonstick skillet, melt butter over medium heat. Add eggs; cook, stirring occasionally, until set. 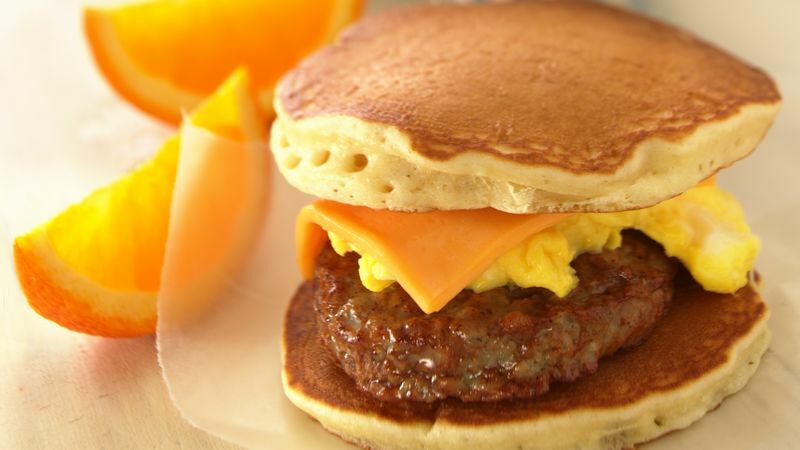 For each sandwich, place 1 sausage patty on 1 pancake; top with one-fourth of the eggs, 1 slice cheese and another pancake. Try slices of Canadian bacon or fully cooked ham instead of the sausage patties, if you like. Start your day off right with these morning sandwiches. Add a piece of fruit and a glass of milk for a great breakfast. You can make the pancakes ahead, stack them with waxed paper between each pancake, and then wrap and freeze until you need them. Pop them in the toaster to heat.